Ever since Al Shudde opened a hat store in Houston in 1907, four generations of Shudde men have been serving those who know the importance of a good hat. Several years ago in Houston, Edward (one of those who can wear any hat with style and conviction) spotted a man wearing an exceptional cowboy hat. After chasing him down, Edward learned that it came from Shudde Brothers Store and Hat Factory, and yesterday we made a pilgrimmage. What a wonderful place -- hats, hat forms, hat steamers, and Neal Shudde who knows all there is to know about fitting, wearing, and maintaining hats of character. I nearly succumbed to a black wool derby, thinking that wearing it would unravel the unbearable lightness of being. 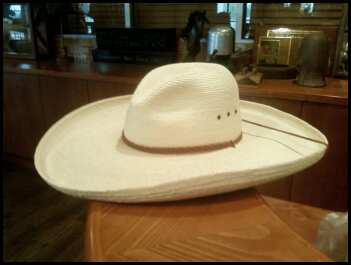 I did receive a gift of sharp, narrow-brimmed, flat-topped, straw hat with attitude. I think that, wearing it, I will be unstoppable. Edward looked fantastic in a black top hat, but he was on a quest for that exceptional hat. It was amazing. It was undeniable. It was Edward. Perfect!! I think you are both good hat wearers!! If the hat has a crown, I'm okay. Put a beret on me, and somber people break out in uncontrollable laughter.